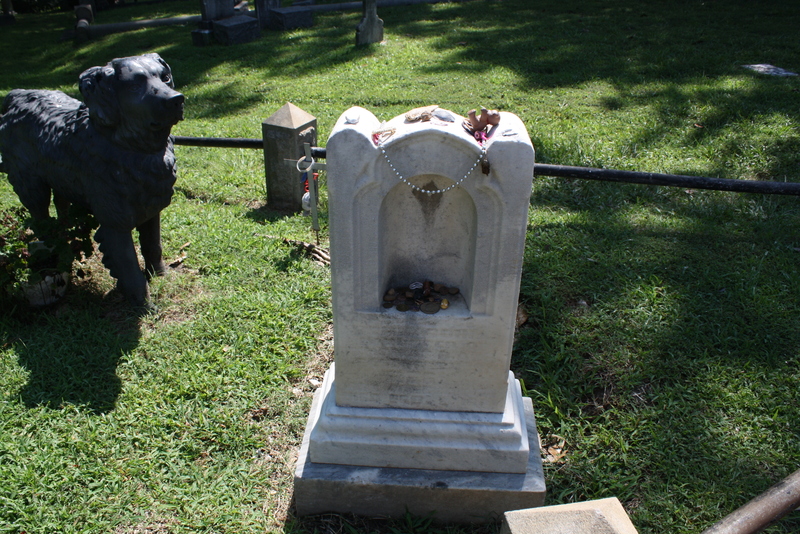 The Iron Dog who watches over Florence Rees’ grave in Richmond’s Hollywood Cemetery is one of the most curious and beloved features on the grounds. When I took these photos over a year ago the bedstead-styled grave was decorated with coins, jewelry, toys and other grave goods, a sight which always warms my heart. Florence, a daughter of Thomas B. and Elizabeth S. Rees, only dwelled amongst the living for less than three years according to her death notice below. She died from scarlet fever, an all too familiar cause of death for children in the 19th century in my research. In Hidden History of Richmond Walter S. Griggs describes the various legends surrounding Black Dog Hill. In one story the statue was placed at the grave by an anonymous benefactor. This mysterious person had remembered how much Florence loved the dog when she and her father walked by the shop where it was displayed on Main Street. Two other possibilities are that either the dog’s owner gave it to the family to spend eternity with Florence or that Thomas purchased it for the same purpose. Another tale passed down through the decades is that the dog was taken to the cemetery to save it from being melted down for bullets during the Civil War. Even when needed materials were in short supply, no one would dare destroy a sacred grave statue. How the statue landed in the Rees plot is shrouded in mystery but regardless of its origin, if not for the black cast iron Newfoundland Florence Rees might have faded into obscurity along with so many others.